Game provider Evolution Gaming is responsible for the production of many different casino games which can be found on the internet. They are possibly the biggest name when it comes to live casino gambling, which means that they make it possible for you to try your luck on many different types of tables. But that isn’t the only thing they produce. In addition to live casino games, they now also provide us with RNG games! This includes RNG Roulette, which is a game that has been around for much longer thanks to other developers like NetEnt. But this new version by Evolution Gaming might be even better to what we have been used to so far! Again, this brand is mostly famous for its live casino games. Evolution Gaming has been making a name for itself for years, which means they are now established all over the world. For example, they run live studios with thousands of employees in Latvia, Malta, Canada and so on. But that isn’t all. They also offer their live casino services in other countries like Belgium and Spain. The best things about their live casino games are that they always look nice, they have incredibly professional dealers, they offer many unique game versions and they are easy to navigate through. Even on mobile devices like smartphones and tablets! It looks like Evolution Gaming has taken control of a significant portion of the market and therefore it shouldn’t come as a surprise that they are trying to expand their horizon. Which of course explains why they’ve now started offering table games which are based on an RNG. Just like every other year, ICE took place in the month of February in 2018. This event is all about the online gambling industry, which of course meant that Evolution Gaming was also in attendance. At ICE 2018 they also had a big announcement to make: They were about to start offering RNG table games. At first, only a few select casinos were allowed to have them and a lot of testing had to be done. But by now you can find these tables (like RNG Roulette) at many different online casinos. As they are pretty much as you would expect them to be! We have been able to play RNG Roulette online for many years, but those were made by different developers. For example, the ‘online roulette’ tables by NetEnt have been around since forever. That means we’ve been able to play them for years, but that doesn’t mean Evolution Gaming is coming with the exact same product. The idea behind this old-fashioned table game will of course remain the same, but we’re still going to see a different product. Because let’s be honest. Those online table games by NetEnt and other developers have been around since all of eternity and that isn’t hard to see. They don’t look very nice, they have a poor resolution, no sweet animations and so on. And Evolution Gaming has of course been able to work on that quite a bit! 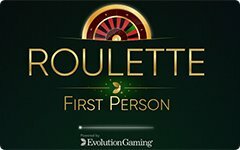 The new RNG Roulette tables by Evolution Gaming go by a specific name. They called them ‘First Person Gaming’ and that is probably also the term they use in the lobby of your favourite online casino. But the name isn’t all that important. In a nutshell, this game is no different than all of those classic online table games that we are used to. Betting is done in pretty much the same way and winning doesn’t happen any differently either. There are however two differences that you may notice straight away. Firstly, these FPG games look a whole lot nicer, with slick animations and so on. And then there is also a big red button which is shown on the edge of the roulette table. It kind of looks like an alarm button with the words ‘go live’ written on it and it does exactly what you would expect: When you press it, you are launched through a window and you will end up at one of their wonderful live roulette tables. 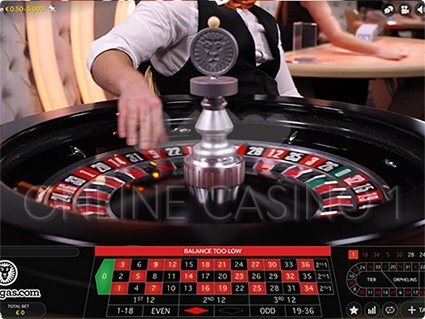 The images below are screenshots of the First Person Roulette table at LeoVegas. The first screenshot is how the table appears directly after clicking on the “Go Live” button. The player has to select YES or NO. 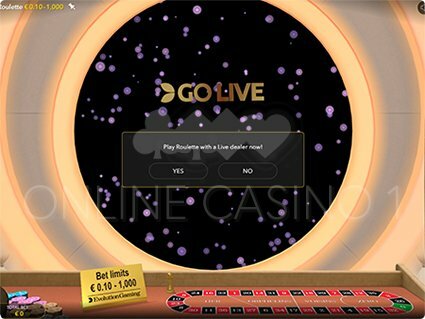 When selecting YES, the player is redirected to one of Evolution Gaming’s live roulette table, as pictures in the second screenshot. Now you may be wondering what is the difference between RNG Roulette and Live Roulette. The short answer to that question is that RNG Roulette is played against the computer, while Live Roulette is played against a real live dealer with a mechanical table game. In other words, the online (FPG) version relies entirely on software. That means your odds are determined by the program, after which you will get random results from your game session (the abbreviation RNG stands for random number generator). A table in the live casino however has nothing to do with computers. Because the results from that game simply depend on where the little ball ends up and nothing else.